Visia skin and complexion analysis uses multi-spectral imaging to reveal damage and signs of ageing on and beneath the surface of the skin that is not visible to the human eye. Visia's computer imaging enables The London Dermatology CentreTM s' practitioners to evaluate the health and appearance of your skin based on eight criteria that affect your complexion. Utilising state-of-the-art IntelliFlash® and Canfield's RBX® Technology, the Visia Skin Analysis is able to identify and visualise a number of skin components to produce a detailed skin complexion report. This tool allows us to show you the effects of various skin conditions, any improvements from treatments and provides a detailed report of your skin status to allow us to advise you on the best skin rejuvenation treatments. 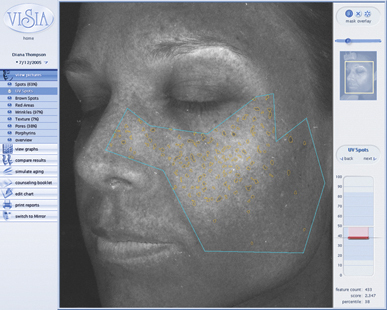 What are the criteria that you can analyse with Visia Skin Analysis? Spots: A number of different skin lesions are identified as spots. These typically include brown or red skin lesions such as freckles, acne and acne scars, hyper-pigmentation and vascular lesions. The Visia machine is able to differentiate spots and highlight them in reports by the idendification of certain colours and their contrast from the background skin tone. Spots can vary in size and shape but are generally circular. Pores: Pores are the tiny circular surface openings in the skin. Pores appear darker than the surrounding skin due to the shadows that are created when light falls naturally on the face. This feature of pores in addition to their circular shape, allows the Visia machine to identify pores. Wrinkles: Wrinkles are furrows, folds or creases in the skin, which increase in occurrence as a result of sun exposure. They are associated with decreasing skin elasticity and aging. Depending on your facial expression, the identification of wrinkles on the Visia machine varies and is a useful tool to show where you are experiencing the most wrinkles. The appearance of fine lines and wrinkles is closely associated with aging. 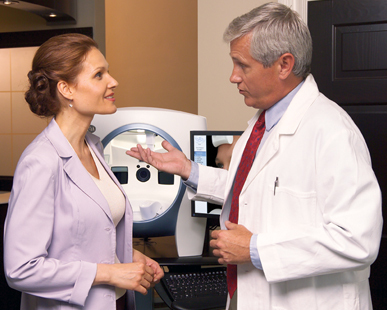 Many patients have Visia analysis before commencing facial rejuvenation treatments. Texture: the texture of skin is analysed by looking closely at the changes in colours and shadows in the surrounding skin. It is an analysis of the smoothness of the skin. Peaks and valleys in the skin can be isolated and the machine will highlight these in yellow (peaks) and blue (valleys) to allow you to see the extent of different textures in the skin. Porphyrins: Propionibacterium acnes is the name of the bacteria associated with acne. The bacteria is known to produce a substance called porphyrin. Porphyrins are bacterial excretions that can become lodged in pores and lead to acne. Porphyrins can be identified with UV light and can be helpful in deciding on the best treatments for acne. UV Spots: In normal light UV spots are not usually visible to the naked eye. The presence of UV spots are a good indicator of skin damage. These spots occur when melanin (a pigment in the skin) collects beneath the skin surface due to sun damage. The Visia machine is able to detect these spots and you will be able to see areas of sun damage. Red Areas: There are many causes of redness on the face. This includes conditions such as acne, rosacea and spider neavi. Red areas are caused by blood vessels and haemoglobin (a component of blood) that circulates in the papillary dermis (a deeper layer of the skin). The Visia machine is able to detect these areas using RBX Technology. Brown spots: Brown spots are areas of hyperpigmentation (skin that has become darker than the normal surrounding skin). Brown spots include freckles, moles, and melasma. Brown Spots occur from an excess of melanin. Melanin is produced by melanocytes, skin cells in the bottom layer of the skin. Visia analysis can also report skin age. Using the criteria above the Visia analysis compares your skin results to that of others of the same age and ethnicity to provide additional information about your skin age and complexion results. We can provide you with a copy of this report. How will the results of my skin analysis be used? Based on the results of your skin report, your practitioner will be able to recommend treatment and skin care options that are best suited to your skin condition. You will also have the opportunity to ask about any of the individual results and to discuss your options. The London Dermatology Centre uses the skin data to determine an effective rejuvenation regime for your specific needs. This can include a number of treatments such as skin peels, facials, laser treatment or anti-ageing injections such as Botox and Restylane. Find out more about facial rejuvenation treatments here. A home routine will also and most importantly be provided as daily care and cleansing with products to match your skin type, life style, age and condition is more important than any treatment that any medical spa can offer you. Please remember that one product does not fit all and your face is as individual as your fingerprint. Whether you are seeking Visia analysis for general rejuvenation or to help diagnose or monitor a skin condition, you will need to come in for an initial consultation. All patients who visit the London Dermatology Centre begin their treatment process with an initial consultation with one of our practitioners. The next step is to examine your skin thoroughly. The Visia Complexion Analysis will form part of the thorough examination of your skin and will add valuable information about the current condition of your skin. This will help your practitioner to formulate a diagnosis and provide you with a personalised treatment plan. Some conditions will require further testing in order to be diagnosed accurately. Alternatively, if the purpose of analysis is for rejuvenation, the skin complexion report will provide the necessary information to allow our practitioners to recommend treatments that will address your areas of concern. For more information regarding our Visia Complexion Analysis, please call the clinic on 020 7467 3720.